Photos by The Bucket List Mom in collaboration with Wall-Ah. As always, all opinions are my own. My four-year-old has a very eclectic bedroom theme these days. We went from a French-inspired toddler room to more of a princessy vibe. We just add pieces as we find them or as Charlotte insists she needs them. 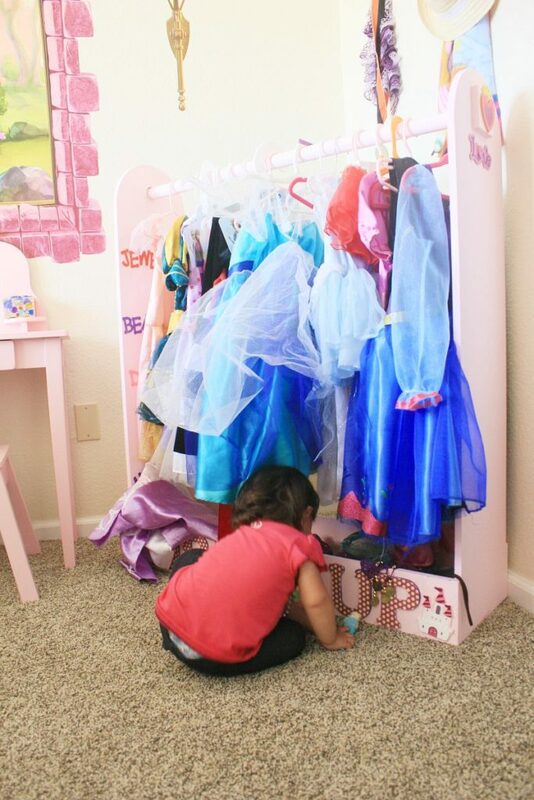 We initially didn’t go after a princess theme, but as we started adding furniture and decor, it was apparent that princess land is where this was headed. My father-in-law made an adorable dress-up wardrobe for the girls, a ruler-style measuring board and completed the room with a little pink vanity. On the opposite side of the room is a tall Kidkraft dollhouse which I found at a local thrift store for $10, a metal bicycle on the wall (TJ Maxx), and a hand-me-down toy storage unit full of Barbies and Shopkins. Charlotte also has a window seat in her room which is basically just a collector for random toys, her piggy bank and some art supplies. The wall along my daughter’s bed was very empty after removing all of the French wall decor a year or so ago, but I could never really find anything to fill it. I’m very picky when it comes to wall decor and I don’t like anything too permanent (i.e. things that require anchor screws), so it’s been sitting blank for a while. I had thought about adding wall decals to the wall, but had never found any that she loved and that weren’t too complicated to put on the walls. I’ve had a ton of experience with wall decals from lots of different brands over the years. We’ve used damask printed wall decals, iron gate-looking wall decals, playroom decals, and a bunch more. All decals are not the same and they come in lots of different textures and thicknesses. Some claim to be reusable but tear when you try to remove them. Some are so large that it takes an army to apply them to the wall. And some decals are just right – like the ones we just received from Wall-Ah. 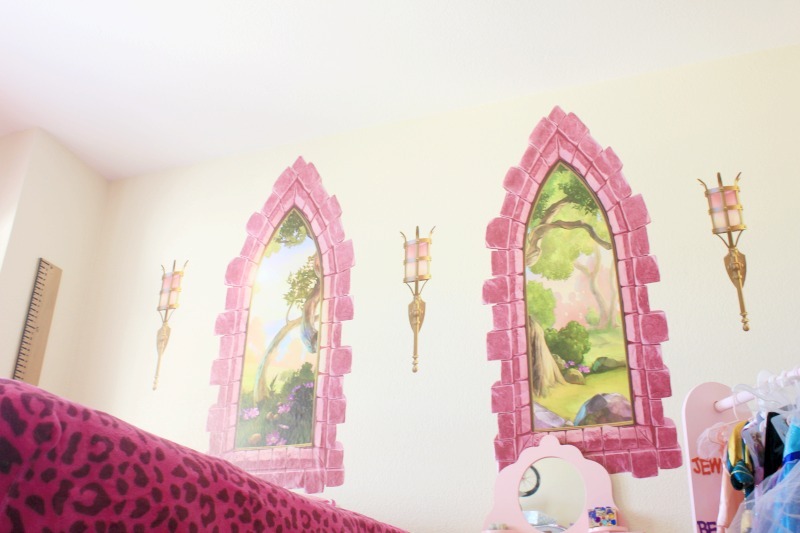 The Pink Castle Windows wall decals from Wall-Ah are sold in a sheet containing two giant castle windows with brick around them and three wall sconces. The sheet arrives rolled up and rolls out to measure 53″W x 68″H. Each individual window measures 24″W x 59″H. 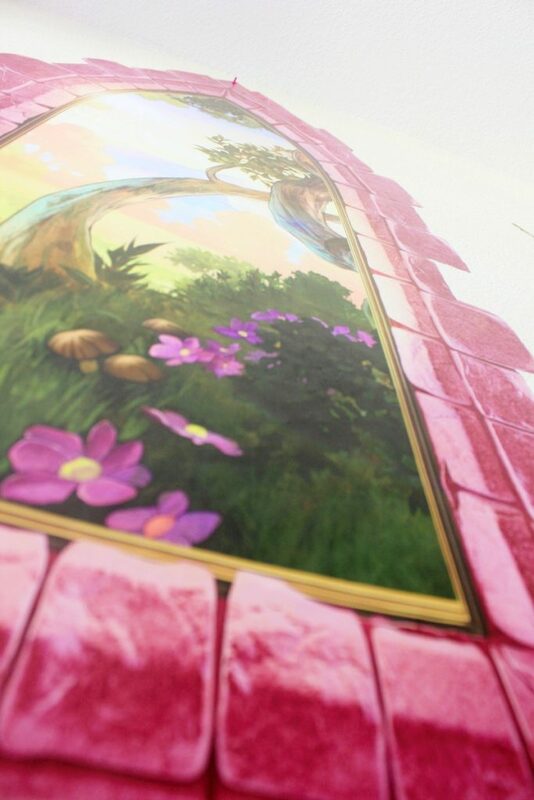 Applying the Princess Castle Wall-Ah wall decals were much easier than I anticipated. Because of their size, I thought I would need some extra hands, but because they were one solid piece, I was able to apply them to the wall on my own. First, I just wiped down the wall with a damp rag and let it dry. 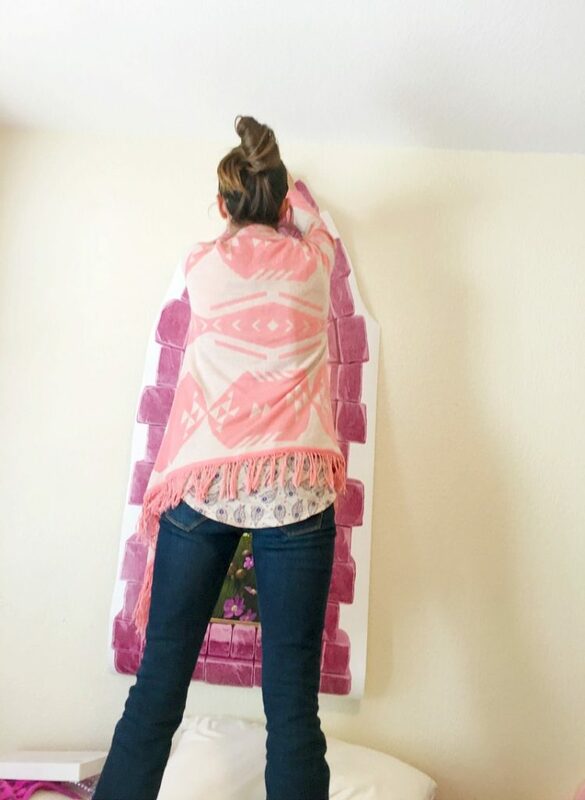 I peeled the backing from the top of the first castle window decal and stuck the decal to the wall. I used the credit card-looking scraper that came with the decal to press it to the wall and gently peeled the backing away as I moved down towards the floor. The walls in our home are textured and painted with a semi-gloss paint, so the heavier decals started to peel away after a few days. I fully expected this, though. I simply added a push pin to the top of each window decal and it worked to keep them in place. Once I had both window decals up, I moved on to the three wall sconces. I didn’t do much measuring and just eyeballed the placement. Since the decals are on the thicker side and have a canvas-like texture, I knew I could easily just move them if they weren’t placed evenly. 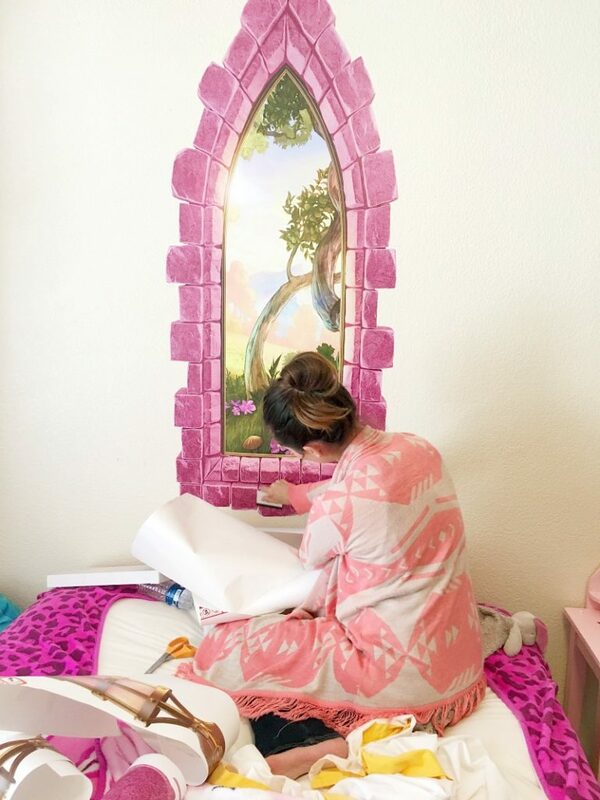 Wall-Ah is all about making decals to transform a room into a place where your imagination can run wild. I have never seen such colorful, creative wall decals before and they are anything but cheesy-looking. You can order everything from giant name decals to character DJ-themed to everything educational. Their decals fit well in classrooms, kid’s bedrooms and even playrooms. These are the best decals I’ve worked with thus far and I will definitely order from them again. 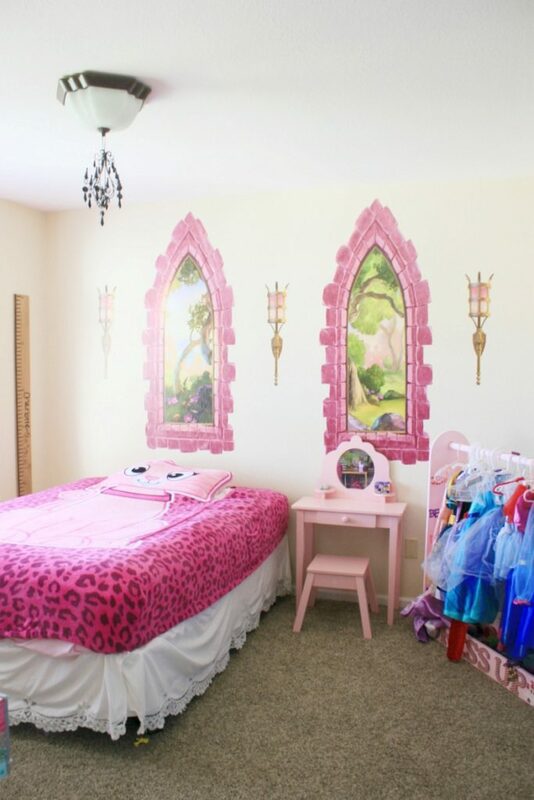 You can find these Princess Castle decals on the Wall-Ah website (www.wall-ah.com). Enter to win a wall decal theme of your choice courtesy of our sponsor, Wall-Ah (approx. value of $150). Please use the Rafflecopter form below to enter. We will choose one winner after 5/10/16. Good luck to you all! I love those "windows"! We're redoing my daughter's room and these would be perfect! I would update my daughter's room! my little girl's room. she is excited!! I would update my younger brother's who is autistic. He would LOVE it! 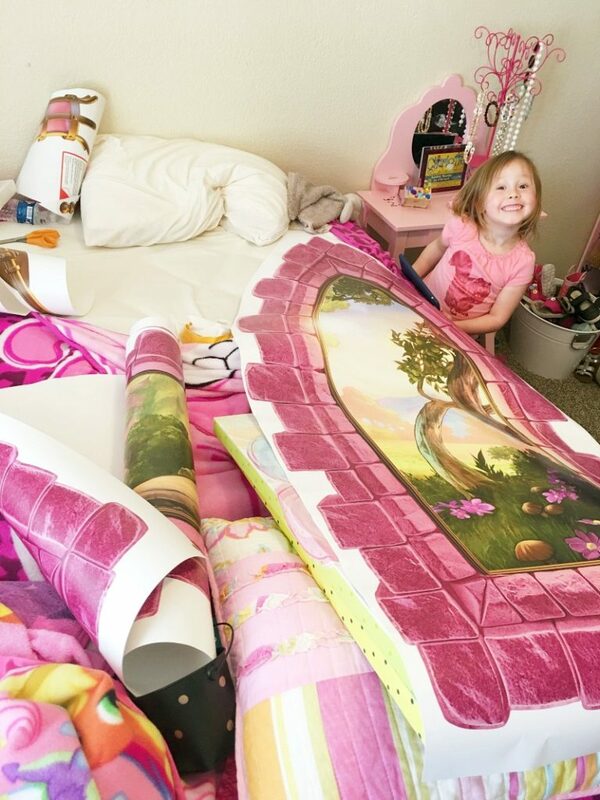 I would probably do my niece's room. I would update my daughter's bedroom. We repainted over the winter but the walls are still blank. I would update my daughters room! I would update my daughter's room! Thanks so much for the chance! I would totally be updating my son's room! I would do a suepr hero theme!! I would love to put Peanuts decals in my bedroom. They are so cute! kristiedonelson(at)gmail(dot)com Thank you. I would update my niece's bedroom! I think the playroom would be a good choice! Thanks so much for the chances to win. We have a Rainbow coming in July and have yet to decorate the room. This would be for our grandbaby who will be born later this year. I would update my granddaughters room. They are princess crazy. I would love to use this to redo my daughters room! She needs a spruce up since she is in her "big girl " room now and there isn't much on the walls yet! This would be perfect! I would update my grandkids' playroom. I would update my daughter's bedroom. I would definitely update my daughters room. She is at that age where we need to update but need to not have it be permanent. these would be perfect. I would update my son's bedroom. I would update my guest bedroom!